The beginning of Flor-de-Lis is closely related to the participation of Pedro Marques as percussionist in the "Adufe project", originally created by Jose Salgueiro as a spectacle for the Expo-98 aimed to showcase the traditional Portuguese instruments. The success of the project and several national and international performances between 1999 and 2000 started the willingness of Pedro Marques to explore all the richness of Portuguese music, combining it with world music. The project begins to take shape in 2001 with the participation of several musicians in recording sessions, including Paulo Pereira, who has remained in the band since it's early days. Songs of the band were naturally created in a process involving various approaches and instruments. The band now performs not only the original compositions of Pedro Marques and Daniela Varela, but also songs of Eugenio de Andrade, Jose Regio, Ary dos Santos, David Mourao-Ferreira, Maria Jose de Castro. 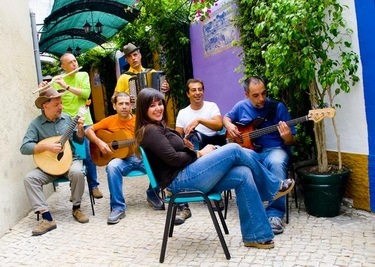 The sound of the band is based on Portuguese folk music, the folklore of fado, but also merging it with sounds from other continents. 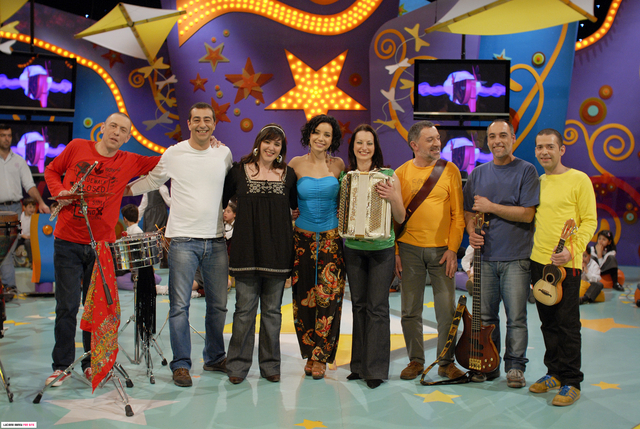 Members of the band are Pedro Marques on percussion (Cajon, darbuka, timpani, conga, bongo, drums), Jose Camacho (Portuguese guitar and guitar), Jorge Marques (guitar and cavaquinho), Paulo Pereira (flute, soprano sax and tenor sax), Rolando Amaral (bass - will not take part in ESC), Ana Sofia Campea (accordion, backing vocalist), and lead singer - Daniela Varela. Daniela started singing in the early age and at the age of 8 already took part in "Young singers of Lisbon" of Ana Faria, and from 10 years was performing in Filipe La Feria's "Jasmine and the Dream of Cinema" and "Godspell ". After a brief break, when she has discovered the interest in painting and illustration, she returned to singing and in 2008 has joined Flor-de-Lis. 2008 was a year of significant developments, highlighted by a stable collective environment which helped to finalise arrangements and get the show on the road, with the performance at the Fabrica Braco de Prata on July 26 and the subsequent nomination for the 2009 Festival da Cancao. Watch the video from the national final here. Listen to the Eurovision version of "Todas as ruas do amor" here. RTP will broadcast final and both semifinals of the contest (second one delayed at 23.00 local), national commentator will be Helder Reis, spokesperson - Sergio Mateus. During the Euroweek, RTP will transmit several Eurovision diaries, incorporated in show "Praca da Alegria" and "Portugal do Coracao" Основание группы Flor-de-Lis тесно связано с участием Педро Маркеша в качестве перкуссиониста в "Adufe project", созданном Хосе Салгуеро в качестве шоу для выставки Экспо-98, с целью демонстрации национальных Португальских инструментов. Успех проекта и ряд выступлений в Португалии и за рубежом в 1999-2000 годах пробудили в Педро желание исследовать все богатство Португальской музыки, совмещая ее с мировой. Проект стал приобретать очертания в 2001 году с участием различных музыкантов в сессиях записи, включая и Пауло Перейру, который оставался в группе с ее ранних дней. Песни группы обычно создавались в процессе, вовлекающим в себя различных музыкантов, и различные инструменты. Группа исполняет не только оригинальные песни Педро Маркеша и Даниелы Варелы, но и песни Еугенио де Андраде, Хосе Регио, Ари дос Сантоса, Давида Мурао-Феррейра, Марии Хосе де Кастро. Музыка группы основывается на португальской фольклорной музыке, фадо, но совмещает ее с музыкой других континентов. В настоящее время в группу входят Педро Маркеш на ударных (кахон, дарбука, тимпани, конга, бонго, барабаны), Хосе Камачо (гитара и португальская гитара), Хорхе Маркеш (гитара и кавакиньо), Пауло Перейра (флейта, саксофон), Роландо Амарал (бас - не примет участия в Евровидении), Ана София Кампеа (аккордеон, бэк-вокал) и солистка - Даниела Варела. Даниела начала петь в раннем возрасте и уже в 8 лет принимала участие в проекте Аны Фариа "Молодые исполнители Лиссабона", с 10 лет выступала в постановках Филипе Ла Фериа "Jasmine and the Dream of Cinema" and "Godspell". После краткого перерыва, когда она открыла в себе интерес к рисованию и иллюстрированию, она вернулась к пению и в 2008 году присоединилась к группе Flor-de-Lis. 2008 год стал важным на пути развития группы, в нем наконец-то сформировался стабильный коллектив, что позволило завершить все договоренности и начать концертные выступления. Группа приняла участие в Fabrica Braco de Prata 26го июля и затем была номинирована на участие в португальском отборе на Евровидение. Видео с национального отбора вы можете увидеть здесь. Версию Евровидения конкурсной песни "Todas as ruas do amor" вы можете услышать здесь. Телеканал RTP покажет финал и оба полуфинала конкурса (второй в записи в 23.00 местного времени), национальным комментатором станет Хелдер Рейс, голоса будет объявлять Серхио Матеуш. Во время Евронедели RTP покажет серию дневников Евровидения в рамках шоу "Praca da Alegria" и "Portugal do Coracao"
- Hello, Flor-de-Lis, and first of all our congratulations for being selected Portuguese representative at Eurovision 2009! How do you feel now, being a Eurovision participant? Jorge Marques (cavaquinho, typical guitar) - We feel very honoured for being selected to represent our Country in the ESC and aware of our duty to do our best on stage. - From the very beginning your entry was clear favourite among Eurovision fans, but faced some tough competition from other participants of the contest being more known on local level. Have you’ve been thinking on victory yourself before the national final? 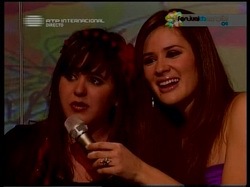 Daniela Varela (singer) - I have to admit that I never thought about winning. Our main goal was to make our project known, so I didn’t have in mind that we would win. J.M. - As soon as one participates in a contest, the possibility of being a winner exists for real. Yes, we thought about it as a kind of dream that could come true. But winning was never our main goal, it was more like doing our best and enjoy the show as much as possible. - How can you describe your song "Todas As Ruas Do Amor" in one phrase? D.V. - We like to say that this song is a postcard of our country that means “From Portugal, with love…” to the rest of the world and we sing about sun, moon, beauty and love! J.M. - It speaks about love and the way people complement each other. - Can you tell the story of the song creation? Was it written specially for the contest? D.V. - This song was created in a very particular universe, along with the rest of the songs. 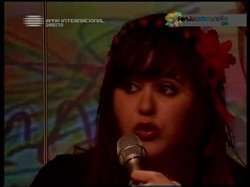 We have many music influences, in a world music environment, from fado to tango, Brazilian, Mexican, Cuban, Arabic, etc. This happens to be our most Portuguese music, the base is our folk songs, and it was written before we even dreamed of going to the contest. J.M. - No. The lyrics were written by Pedro Marques and the song by both, PM and Paulo Pereira even before most of the actual members joined, wich happened last summer. We've agreed to participate with the main purpose to promote Flor-de-Lis and it's music. D.V. - In my case, I have a mother who happens to be a complete fan of Eurovision, so I follow the contest many times… but never occurred in my mind to be a part of it one day. J.M. - I must confess that I'm not a regular Eurovision contest follower. J.M. - Just like I said, we will do our best to represent our Country and enjoy our "once in a lifetime"participation as much as possible. J.M. - We are evaluating that possibility. Yes, it is important by the way people are more receptive to listen, enjoying and vote for music they know already. - Have you already filmed music video for your entry, or are you planning to do it later? - Will the stage presentation of the entry in Moscow be similar to the one we’ve seen in Portuguese NF? Or do you plan something extra for the international audience? J.M. - It is a mix of everything. A good song with a good performance result in a good show. Above all, ESC is a show for people to enjoy. J.M. - Not at all. What might happen is that a participant may try to spread a political message to a larger audience through it. Never the opposite. On the other hand, it is common that friendly Countries vote more for each other than to others. That's part of the nature of our existence we need to accept. D.V. - I guess it can be good. And if is 50% jury, and 50% televoting, I guess it’s fair enough. J.M. - Yes, some of them. J.M. – Surely the Esc, Flor-de-Lis is world music. We want to play live in any place of the world where are people that enjoy our music and our party. - Flor-de-Lis is rather unusual title for a Portuguese band, what meaning have you put into it? D.V. - Lisbon is a very white and sunny city. That was our biggest inspiration. I’ve always been in love with this town and really identify myself with it (well, is my hometown after all… looool). “Flor” means flower in Portuguese. So that’s why is Flor-de-Lis(boa). J.M. - It has mostly to do with Lisbon, it's beauty and it's flowers, loved by all of us, a message we want to take to every place where it is welcome. 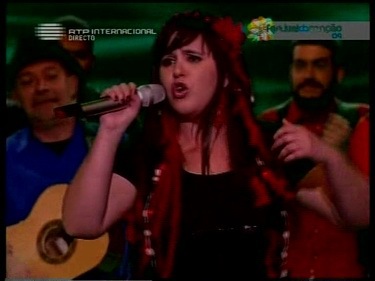 - You’re performing national flavoured Portuguese music, but unusually trying to combine it with a world music. Why have you decided to stick with this style? D.V. - Yes. We had so many influences by other cultures that it’s hard not to feel them. Is like we travel around this fantastic world, but our heart is always in Portugal. J.M. 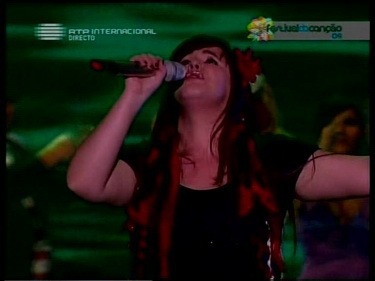 - Portuguese music is the beginning for everything we do. But Portugal's culture in itself is more like a mix of influences gathered along its over 900 years of history through it's permanent close and friendly relations with foreign Countries all over the world. What we want to show is that almost all world's music can fit into Portuguese music and culture in some way, so everyone on Earth feels welcome here (laugh). - Has the band made any album releases? D.V.- We have enough songs to make one, so maybe there will be a good surprise. J.M. - Not yet, but we're planning to do so very soon. - Daniela, you have just recently joined the band. Has it changed the music band is performing, has you managed to add something special? D.V. - From Russia, I’m more familiarized with classical authors, and I must confess that I love Borodin, Rachmaninoff, Stravinsky, Prokofiev and, of course, Tchaikovsky (I was really little when I started to listen this one). In the singing area, I like Anna Netrebko a lot (especially her version of “Musset’s Waltz”, from “La Boheme”, Puccini). D.V. - Thank you very much and I hope to have a real good time in Moscow, with all the contestants, and of course that everybody would be very welcomed! We will take in our bag a bit of the Portuguese joy, music and love! J.M. - We would like to thank to everyone for the support and hope to meet you guys in Moscow and very soon after for a Flor-de-Lis live show in a nearby city. - Thank you for the interview, good luck with your preparations and see you in Moscow! - Привет, Flor-de-Lis! Наши поздравления с тем, что вы стали представителями Португалии на Евровидении 2009! Что вы чувствуете сейчас, будучи избранными конкурсантами Евровидения? Хорхе Маркеш (кавалькиньо, гитара): - Мы весьма польщены тем, что нам выпал шанс представить свою страну на Евровидении, и мы знаем о том, что теперь обязаны показать на сцене все, на что мы способны. - С самого начала ваша песня была очевидным фаворитом поклонников Евровидения, но вам пришлось столкнуться с конкуренцией исполнителей, которые более известны на национальном уровне. Думали ли вы сами до национального отбора о том, что вы можете победить? Даниела Варела (солистка): - Я должна признать, что о победе мы никогда не думали. Нашей целью было просто познакомить зрителей с нашим проектом, поэтому я даже и подумать не могла, что мы сможем победить. Х.М. : - Всегда, когда кто-то принимает участие в каком-либо конкурсе, он знает о том, что есть шанс победить. Мы думали об этом как о какой-то мечте, которая может сбыться. Но победа не была нашей основной целью, мы просто хотели показать, на что мы способны и сами получить удовольствие от участия в фестивале. - Как бы вы описали вашу песню "Todas As Ruas Do Amor" в одной фразе? Д.В. : - Мы любим говорить, что эта песня как открытка о нашей стране, "Из Португалии с любовью", для всего мира. Мы поем о солнце, луне, красоте и любви! Х.М. : - Она рассказывает о любви, и о том, как люди могут делать друг другу комплименты. Д.В. : - Песня была написана в очень особенной атмосфере, как и другие наши песни. У нас множество музыкальных влияний, от фадо до танго, бразильская, мексиканская, кубинская, арабская музыка и т.д. Это самая настоящая Португальская музыка, основанная на наших фольклорных песнях, и она была написана еще за долго до того, как мы даже подумали об участии на конкурсе. Х.М. : - Нет. Текст написал Педро Маркеш, а музыку Педро и Пауло Перейра, это произошло еще до того, как к группе прошлым летом присоединились новые участники. Повторюсь, мы согласились участвовать в конкурсе, чтобы показать зрителям обычную музыку группы Flor-de-Lis. - Вы вообще следите за конкурсом Евровидение? Что думаете о шоу в-общем? Д.В..: - В моем случае, моя мама - большая поклонница Евровидения и поэтому я его тоже постоянно смотрела.... но никогда даже не думала, что когда-то могу на него попасть. Х.М. : - Я должен признать, что меня нельзя отнести к тем, кто постоянно следит за Евровидением. Х.М. : - Представить наилучшим образом нашу страну, и получить как можно больше удовольствия от этого шанса, выпадающего один раз в жизни. Х.М. : - Не сейчас. Даже и в будущем я не думаю, что это произойдет. Но кто знает... (смеется). Х.М. : Мы рассматриваем такую возможность. Да, это важно, потому что люди обычно лучше воспринимают и голосуют за песни, с которыми они уже знакомы. - Планируете ли вы снять видеоклип на вашу конкурсную песню? Х.М. : - Нет, мы используем выступление с национального отбора. - Будет ли ваше сценическое выступление в Москве похоже на то, что мы могли видеть на Португальском отборе? Х.М. : - Это смесь всего. Хорошая песня с хорошим исполнением выливается в хорошее шоу. Ведь, Евровидение, это прежде всего телешоу, от которого люди должны получать удовольствие. Х.М. : - Совсем нет. Может лишь случиться, что конкурсант решит попробовать передать через участие в конкурсе какой-то политический мессадж. Но никогда не наоборот. Хотя, с другой стороны, обычно, что дружественные страны поддерживают друг друга. Это часть нашей жизни и с этим надо смириться. Д.В. : - Я думаю, что это будет неплохо. В случае 50% жюри и 50% телеголосования, я думаю, что результат может оказаться справедливым. Х.М. : - Слышали только некоторые. Х.М. - Без сомнения, пока это Евровидение, потому что Flor-de-Lis играет world music. Мы хотим выступать вживую в любой точке планеты, там где люди будут получать удовольствие от нашего выступления. - Flor-de-Lis - достаточно необычное название для португальской группы, какой смысл вы вкладываете в него? Д.В. : Лиссабон - очень красивый и солнечный город. Именно он вдохновил нас на это название. Я всегда была влюблена в этот город и ассоциирую себя с ним (ну, это в-общем то мой родной город и есть :) . "Flor" означает цветок на португальском. Поэтому Флор-де-Лис(сабон). Х.М. : - Да, название прежде всего происходит от города Лиссабона, его красоты, его цветов, которые обожаем мы все, и мы хотим передать его красоту миру. - Вы исполняете музыку с национальным португальским оттенком, но весьма неожиданно пытаетесь внести в нее и элементы world music. Как вы определились с этим стилем? Д.В. : - Да, это так. У нас много влияний со стороны других культур и это чувствуется в нашей музыке. Получается, что, как будто, мы путешествуем по нашему фантастическому миру, но наше сердце всегда в Португалии. Х.М. : Португальская музыка - это основа всего, что мы делаем. Но Португальская культура сама по себе содержит смесь различных влияний, накопленных за 900 лет истории, благодаря ее постоянно тесным и дружественным связям с различными другими государствами. Что мы хотим показать - это то, что музыка практически любой части света может быть инкорпорирована в португальскую музыку и культуру тем или иным образом, что каждый человек на Земле может почувствовать у нас себя как дома. - Выпустила ли ваша группа уже какие-то альбомы? Д.В. : У нас уже есть достаточно песен на него, поэтому, возможно скоро вас ждет сюрприз. Х.М. : Пока нет, но планируем в самом ближайшем будущем. - Даниела, вы только недавно присоединились к группе. Смогли ли вы изменить ее музыку, добавить в нее что-то свое? Д.В. : Из России, я знаю классических авторов, я могу сказать, что обожаю Бородина, Стравинского, Прокофьева, и, конечно же, Чайковского (слушать его начала еще с раннего детства). В области песенной музыки, мне очень нравится Анна Нетребко (особенно ее версия "Musset's Waltz" из "Богемы" Пуччини). Д.В. : Большое вам спасибо, и я надеюсь, что мы отлично проведем время в Москве, вместе с другими конкурсантами и приглашаем вас всех присоединиться к нам. Мы захватим с собой в багаже португальское веселье, музыку и любовь! Х.М. : Я хочу поблагодарить всех за поддержку, и надеюсь, что мы встретимся с вами в Москве, а после Евровидения может быть и на концерте Flor-de-Lis в вашем родном городе. Flor-de-Lis band has scheduled several home concerts in Lisbon. Spanish entrant Soraya has met Portuguese representatives, band Flor-de-Lis while being in Lisbon during her promotional tour, reports Correio da Manha. Soraya has also demonstrated almost fluent ability to speak in Portuguese: "I have a cousin in GNR and family members in Alentejo. My uncle has a restaurant in Portalegre", explained singer. Both Flor-de-Lis and Soraya consider Norway as one of the strongest competitors in the Eurovision. Во время промо-тура в Лиссабоне представительница Испании Сорайя встретилась с представителями Португалии группой Flor-de-Lis. Сорайя также продемонстрировала способность практически в совершенстве говорить по португальски. "Мой двоюродный брат служит в португальской армии, члены моей семьи живут в Алентехо. У моего дяди ресторан в Порталегре", объяснила певица. 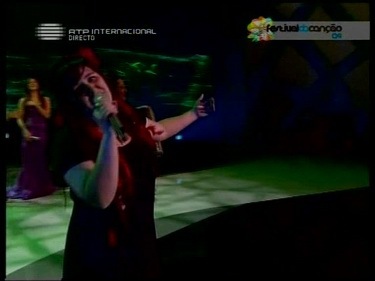 Several irregularities in Portuguese preselection, as reported by Eurovision-Portugal.pt.vu. On 27th of January, Miguel Cervini, performer fo the song "Nao Esta" has withdrawn his candidacy. Since last week several singers saw their votes being reduced, as number of votes have been considered fraudulent. One of the most serious cases was with this singer who lost more than 4 thousand votes, going from top places to the last. After that Miguel C. came into contact with organizers of the contest and, in addition to requesting the immediate removal of his entry, also demanded "a justification for elimination of more than 4,000 votes". In response, national broadcaster has stated that his entry had received a huge amount of votes in a very short time, which justified the removal of these votes. RTP agreed to the request of the singer to withdraw, as, according to the view of the organizers of the event, you can not "force anyone to stay in competition." Finally, the singer made a statement to clarify the situation: "I had never created nor encouraged any kind of intervention in the system of voting. Neither I nor my family nor my friends have time, patience or interest to create fake e-mails and add these votes". Also, in previous days it has been discovered that two songs taking part in the contest have been publicly performed before October 1, 2008. One of them is "Sinto Sentido" by Pedro Duvalle, which has been performed publicly for at least half of a year. It is available on the homepage of the singer, as live recording from the concert held on 17th of June 2008. Video of the other performance has been available on Youtube profile of the singer, though now it has been reuploaded under a new date. Pedro Duvalle however stated that "he has contacted organizing team of the festival, who informed me that there would be no problem, since the song is still new, it has never been published or presented on television". Second case is with entry of Pedro Daniel with "Sem Ti Nao Quero Acordar". Song has definitely been performed back in 2006, including in a TV appearance. Singer stated: "The song is original and unique and I can prove it". Regarding the two cases of possible breaches of the "October 1" release rule, head of Portuguese delegation has stated, that production team will evaluate these cases only if these 2 songs will qualify to the final of preselection. RTP reglament of "Festival da Cancao" only require the songs to be "new and original", not giving reference to EBU October 1 rule. Были отмечены несколько нарушений в португальском отборе, как сообщает Eurovision-Portugal.pt.vu. 27го января, Miguel Cervini, исполнитель песни "Nao Esta" снял свою заявку. На прошлой неделе телеканал пересчитал голоса ряду исполнителей и удалил те из них, что были сочтены фальшивыми. Одним из более серьезных случаев стали голоса за этого исполнителя, более 4000 голосов были удалены, что привело к его падению с первых мест на последние. После этого Miguel C. обратился к организаторам конкурса, потребовав немедленно снять его заявку, а также "объяснить удаление более 4000 голосов". В ответ национальный канал заявил, что за эту песню за очень короткий срок было получено очень много голосов, что и привело к их удалению. RTP удовлетворило требования певца снять его заявку, потому что по словам организаторов "мы не можем заставить кого-то оставаться в конкурсе". Сам же певец сделал следующее заявление, чтобы объяснить ситуацию: "Я никогда не вмешивался и не поощрял вмешательства в систему голосования. Ни я, ни моя семья, ни мои друзья не имеют свободного времени, терпения или интереса создавать фальшивые e-mail и добавлять массы голосов". Также, за последние дни было отмечено, что две песни нарушают правила Евровидения, будучи публично исполненными до 1го октября 2008 года. Одна из них - "Sinto Sentido" исполнителя Pedro Duvalle, которая публично исполнялась как минимум полгода. Она была выложена на сайте исполнителя в качестве концертной записи с концерта, прошедшего 17го июня 2008 года. Видео другого выступления было выложено на Youtube профиле исполнителя, хотя сейчас оно было перезалито с новой датой. Сам Педро Дюваль заявил, что связался с оргкомитетом фестиваля "которой проинформировал, что это не проблема, поскольку песня является новой, не опубликованной, и не исполнялась по телевидению". Вторым случаем является песня Pedro Daniel - "Sem Ti Nao Quero Acordar". Песня определенно исполнялась в 2006, включая выступление по телевидению. Сам же певец, однако, заявил: "Песня новая и оригинальная и я могу это доказать". В отношении этих двух песен, португальский телеканал заявил, что рассмотрение будет произведено только в случае их выхода в финал отбора. Регламент "Festival da Cancao" требует, чтобы песни были только "новыми и оригинальными", не давая ссылки на правило 1го октября ЕВС. 19/01 With the end of the Spanish online selection voting, fans should not be worried as online voting is launched in Portugal. 24 songs to take part in online voting have been selected by 4 member RTP jury from 393 submitted entries. Voting has started today at 18.00 CET and will last till January 30th and fans will be able to listen to 1.30 extracts of the songs and cast their votes on RTP page. Note, that it will be possible only to vote 3 times from one IP during the entire process. Half of the songs will proceed to the national final to be held on February 28th. Armando Gama (1983), Nucha (1990) and Luciana Abreu (2005) are among potential finalists. Фанатам не стоит переживать, поскольку одновременно с окончанием испанского онлайн голосования, подобный проект запускается в Португалии. В голосовании примут участие 24 песни, выбранные жюри RTP из 393 поданных заявок. Голосование начинается сегодня в 20.00 Москвы и продлится до 30го января. Послушать полутораминутные отрывки песен и проголосовать можно на сайте RTP. Можно будет проголосовать только 3 раза с одного IP в течении всего процесса голосования. Половина песен выйдет в финал отбора, который состоится 28го февраля. Armando Gama (1983), Nucha (1990) и Luciana Abreu (2005) среди потенциальных финалистов. Submission deadline set for 12th of January. 24 songs will be put for online voting, conducted in period 19-30th of January. 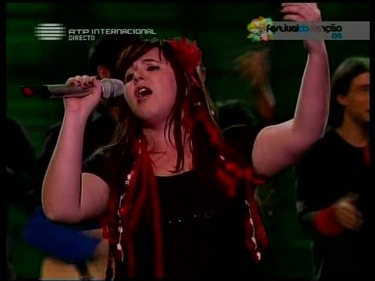 Final of Festival da Cancao 2009 will consist of 12 entries. Winner will be selected by 50-50 mix of jury and televoting. Заявки на участие принимаются до 12го января. 24 песни будут размещены онлайн и по ним будет проведено голосование в период с 19 по 30 января. Финал Festival da Cancao 2009 будет включать в себя 12 песен, победитель будет выбран смесью жюри и телеголосования.